Twitter’s best practices for tweeting don’t appear to mix well with its rules for tweeting, as I found out last month when the social networking company briefly suspended the Twitter account for this blog. While I was able to quickly get the account back online, the episode raises somr issues regarding how Twitter’s algorithm flags media accounts and some contradictions in the company’s guidance for new users. When I found that I couldn’t file a help request to Twitter Support to appeal the suspension of @e_pluribusunum_ through that account, I used my main account (@digiphile). 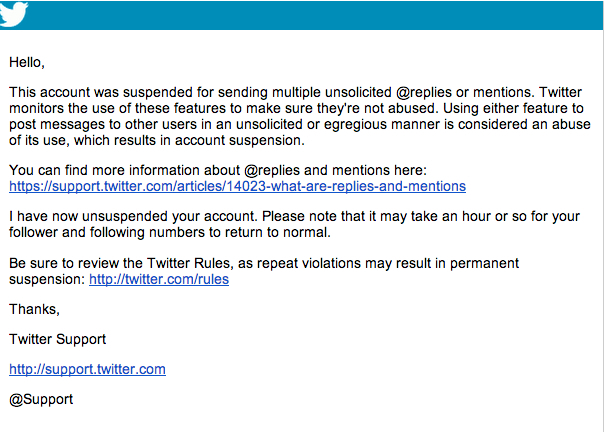 Initially, I thought the suspension was due to spam, similar to the situation David Seaman encountered in 2011. @CalebGarling it likely is an automated suspension by @twitter. I had no email, notification, explanation or recourse: help link was broken. The tweets in question, however, are extremely similar to the way I’ve been using Twitter for years, advise others to use Twitter, and that Twitter itself recommends to new users. Here are the tweets sent the day before the suspension and the three that morning, which I have to assume triggered the suspension. The seventh tweet, embedded above, had six different @names in it, but it was appropriate: I was attributing the source of the information, referring to an NPR program (The Kojo Nnamdi Show) and naming the 4 guests who were on it. The eighth tweet had three @mentions in it, as I had retweeted a media account that referred to a reporter and added the subject of the story for context. In the meantime, I’ve tried to think them through myself. The “newness” of this account likely tripped Twitter’s automated filter, leading to the suspension. That means that other new users have to think about whether they’re sending “unsolicited replies or mentions” to keep clear. I found that deeply jarring. I used the @E_Pluribus Unum_ account exactly as I have @digiphile, for over 7 years now, resharing tweets with attributed context and quotes, tweeting about public figures and government officials, tagging mastheads, retweeting select tweets. If Twitter is suspending new accounts that @mention too many high profile users or reply to them in an “unsolicited” fashion, I can’t help but have serious concerns about Twitter’s future and commitment to being a platform for free expression, government accountability, or hosting civic dialogue. I do see potential issues with “egregious” @mentions — “@reply spam” has been an issue on Twitter for years — but isn’t that exactly what the block button has been used for, or the new abuse reporting button should be used for? People have been tweeting “#FollowFriday” recommendations for years with many unsolicited @mentions. Are they risking suspension? Given reports of retention issues and low activity by most users, an overly aggressive approach to filtering new users that are engaging in activity that Twitter itself recommends, particularly media accounts, strikes me as actively self-defeating. Twitter and its investors should care about the people who never tweet. This experience reminded me that those same parties should care about the people who do tweet and are caught up on algorithmic censorship, followed by vague missives not to talk about other accounts too much. As I’ve written before, Twitter is not a public utility. It’s a private company with a Terms of Service and Rules it itself sets. If Twitter’s users don’t like them or lose trust, their option is to stop using the service or complain loudly on other platforms. In general, Twitter’s record on censorship, Internet freedom and privacy is the best of the big tech companies, as an analysis by the Electronic Frontier Foundation last year highlighted. They’ve gone to bat for their users, from Turkey to Washington. Today, however, I just wish they’d clarify how social those users are allowed to be. Editor’s Note: The headline of this post has been amended, with “After a false positive” added.